Find Premium Platters At Delicious Prices. 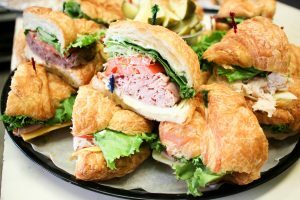 See our Party Trays Below! Our meat and cheese platters are loaded with a generous portion of deli meats and cheeses. We also include a nice bowl of pickle spears. These are always a big hit for parties, baseball games, and social events. Please call for pricing. Loaded with fresh veggies and a bowl with a generous helping of our own house ranch dressing blend. The veggie platters go well with our meat and cheese platter. They are also a big hit for large gatherings, birthday parties and social functions. Please call for pricing. Freshly made with our own super buttery and flaky croissant rolls. We add a generous portion of deli meat, cheeses, and vegetables. This tray is sure to bring a huge smile to all those who partake! Please all for pricing. 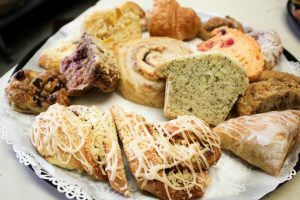 A grand assortment of freshly baked rolls and pastries straight from our wonderful french bakery here in Anacortes, WA. These trays are great for church meetings, social events, and large family breakfast gatherings. Please call for pricing.